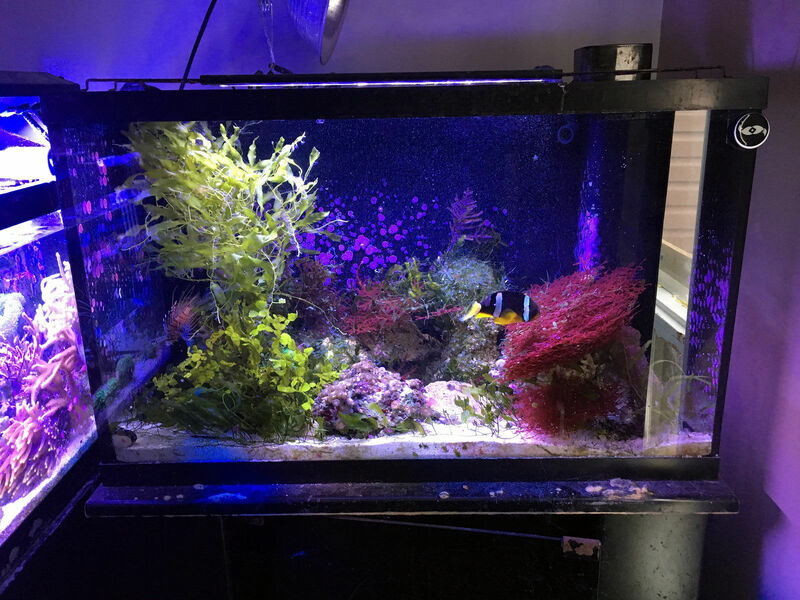 Congratulations to community member Sharbuckle and his 40 gallon nano reef for being selected for our October 2018 Reef Profile! 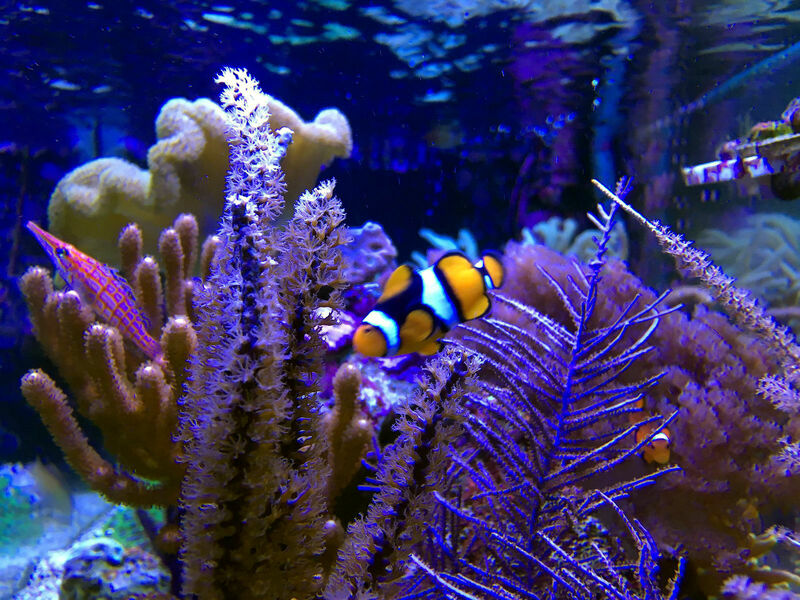 This stunning peninsula reef aquarium features an incredible collection of gorgonians and leathers, coupled with a unique display refugium. 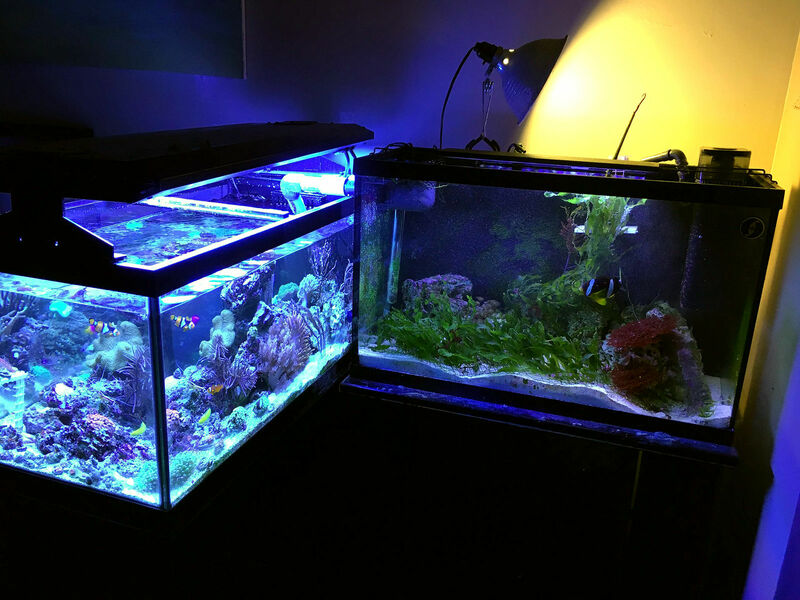 In this article Sharbuckle shares his experiences in the hobby and this aquarium's journey over the year and a half! 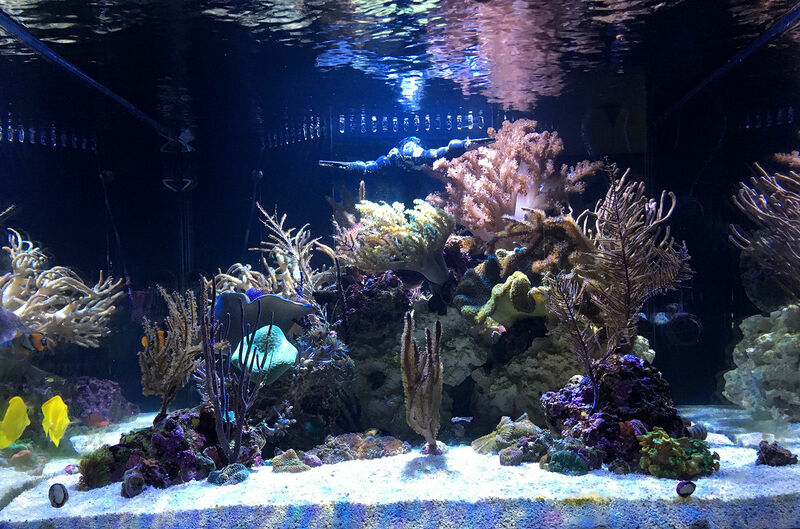 Share your comments and questions in the comments section below, and follow his aquarium journal for additional photos, history, and information about this wonderful reef tank. When I set this tank up my aim was for it to be as low maintenance as possible. I am a hands-off reefer and like to enjoy my tanks more than I like to clean them! My philosophy for this tank was to have a display refugium nearly the same size as the display, chalk full of macros in hopes that it would essentially maintain itself. In the beginning I changed the water once every two weeks, about 20%. After about 6 months I started changing a smaller amount of water, maybe 10% about once every 6 weeks. I rarely run any media, but I throw in some carbon from time to time to polish the water. I started dosing some iodide daily about 10 months in to help with all the softies and mushrooms, I find the mushrooms really respond well to that. I also scrape the glass and empty skimmer cup when needed, but other than that, not a heck of a lot else! I feed a minimum of once a day, sometimes twice. A mixture of New Life pellets, some PE mysis, frozen spirulina brine, flake, and I even started making a homemade frozen blend for awhile (I was cooking at a seafood restaurant, so fresh seafood was cheap and easy to come by). Yellow Fiji Leather, Spaghetti Leather, Two Toadstools, Kenya Tree, Rhodactis, Discosoma, Yuma, Ricordea Florida, a few Zoanthids (had a lot but lost the war to zoa eating nudis), 9 Species of Gorgonia, and Clove Polyps. Caulerpa Prolifera, Codium, Dragons Breath, Red Grape Caulerpa, and about 4 others I don’t know the names of. 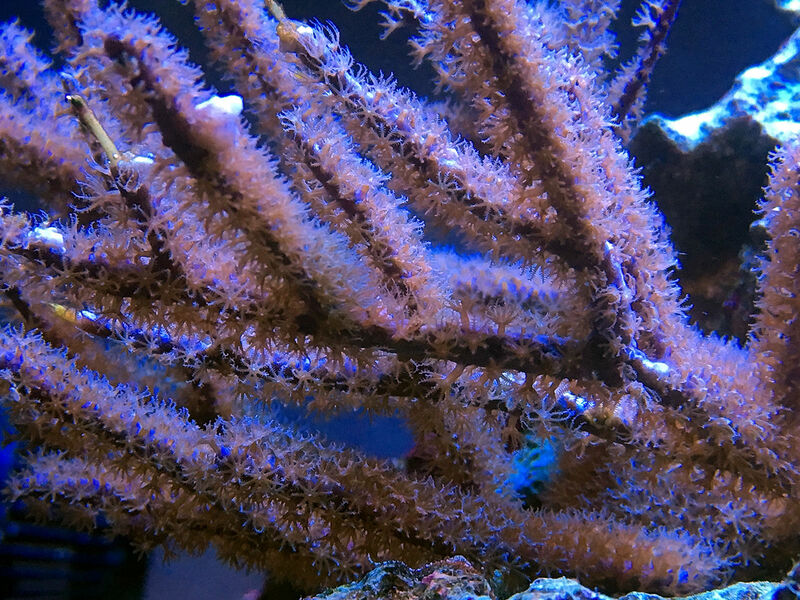 Hundreds of feather dusters in the refugium as well as some cool sponges, red mithrax crab, and a pom pom crab. 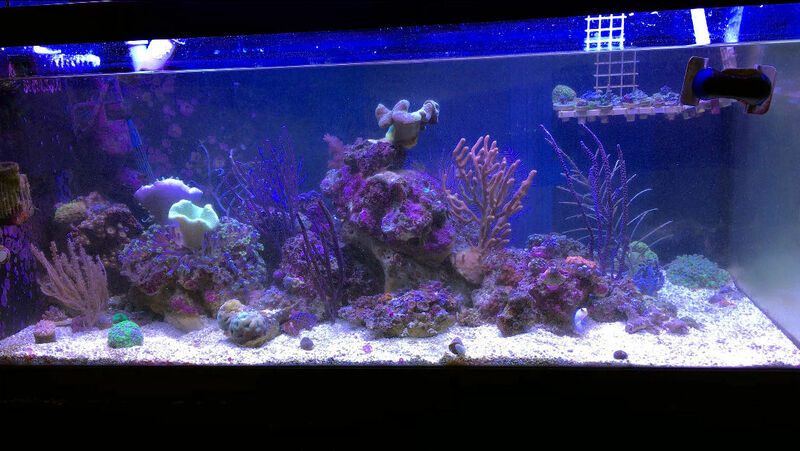 I have been reefing on and off for slightly over 10 years and was lurking on Nano-Reef for most of that time. I started to get serious about it shortly under 4 years ago. Bought a 16g, which turned into a 29g which was probably one of my favourite tanks I have ever set up. It eventually became the display refugium you see today. When my girlfriend and I purchased our first home I decided to go bigger as we were moving from an apartment to a 3 bedroom home. I purchased a used 65g and started to really enjoy it. At about the 9 month mark the 65g cracked from top to bottom and caused some serious damage to my home. 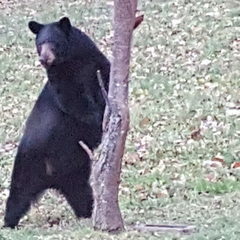 Luckily I was home at the time and was able to save 100% of the livestock. Without anywhere to put them however (other than a small leaky 15g and the 29g I had stored away) I had to liquidate most of my livestock. At this point the 15g sprung a leak and everything was jammed into a 29g. I neglected it for a while and was pretty close to calling it quits. With a little help from my friends and some great words of encouragement from the NR community I decided to continue on and picked up a 40g breeder. The tank transfer went very well and I decided I wanted to have a mix of macros and gorgonian in the display as a peninsula. It looked fantastic in the beginning was was warned the macros would probably take over. That is the point where I got the idea from a friend to add in the gravity fed 29g display fuge. It really took off and added a whole new dimension to the tank. I loved it. I then got very very addicted to zoanthids and palythoa and started spending every last dime on new fancy named ones. I had quite the collection and even started making some good money from frags. This is where my war with zoanthid eating nudis started to take place. I was usually pretty diligent with dipping new additions and one day just threw some new zoas in the tank not thinking. Well, dumb move. The nudis started to multiply and destroyed $$$$ worth of coral. I tried natural methods at first, added a yellow wrasse and leopard wrasse. Didn’t work, desperation kicked in and I added another wrasse, (BIG MISTAKE) the neon or yellow head wrasse swiftly killed my yellow, leopard wrasses, cleaner shrimp, peppermint shrimp, clean up crew. Ugh... and despite the neon wrasse being pretty good at killing the nudis, they persisted. After losing probably 80% of my collection I decided to quarantine, dip, and liquidate the rest. The neon wrasse lived out its life in my lagoon tanks sump before that tank succumbed to velvet... but that’s another story. After the wrath of nudi and neon I sort of let the tank run on autopilot as I was defeated. The last of the zoanthids were eaten and the nudis sort of died off after the food supply was exhausted. Found myself buying lots of rhodactis mushrooms a while back and that is my new addiction. 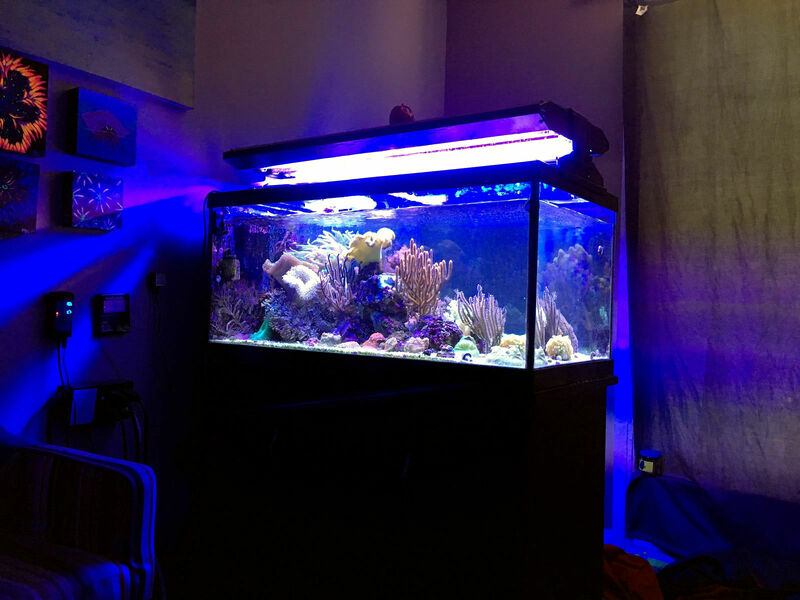 Other than the nudi disaster, the tank has been running quite well and growing pretty good. Gorgonians are clearly my favourite type of coral and people often ask what I do differently to keep them happy. Truthfully, I don’t do too much. Every once in a while when I remember I’ll dose the tank with some phyto. 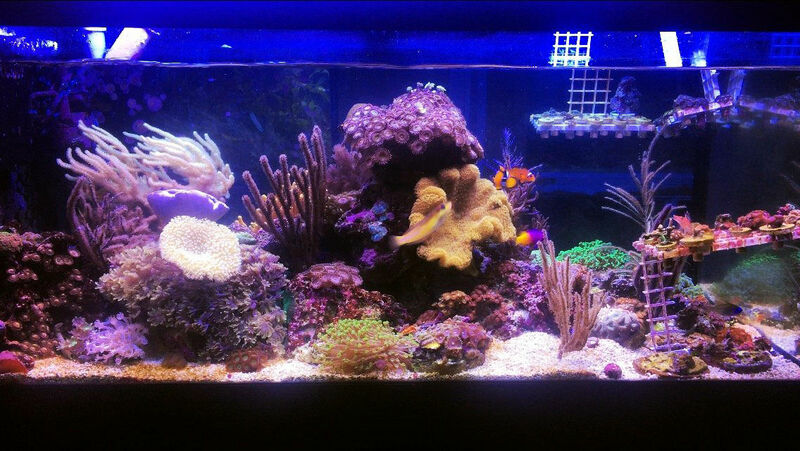 I’ve also been recently feeding the tank with NLS reef cell. The gorgonians and leathers seem respond quite well and I will continue to feed the tank maybe once a week. I also believe that the large display refugium has something to do with the health of the gorgonia. 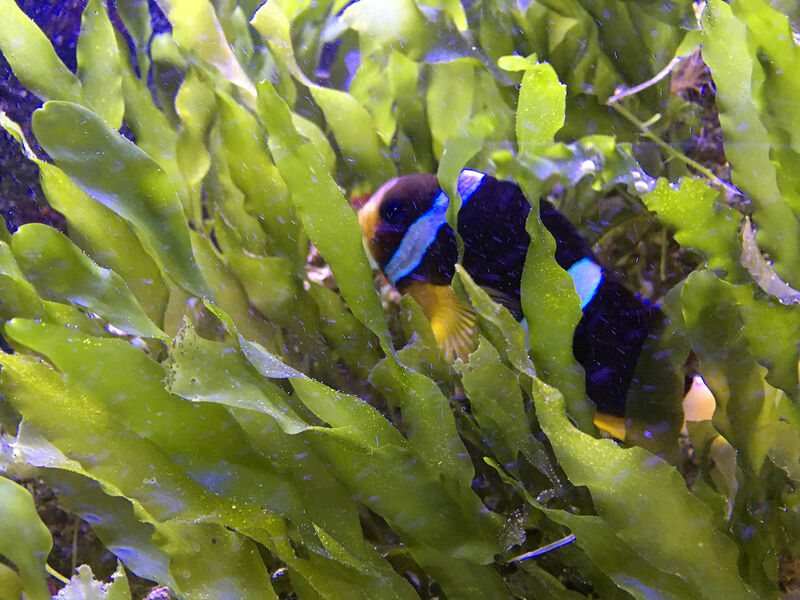 The added water volume and wealth of macroalgae help keep any film algae off the gorgs. Once I added the fuge I noticed I didn’t have to scrape the glass as much or blow the algae off of them. 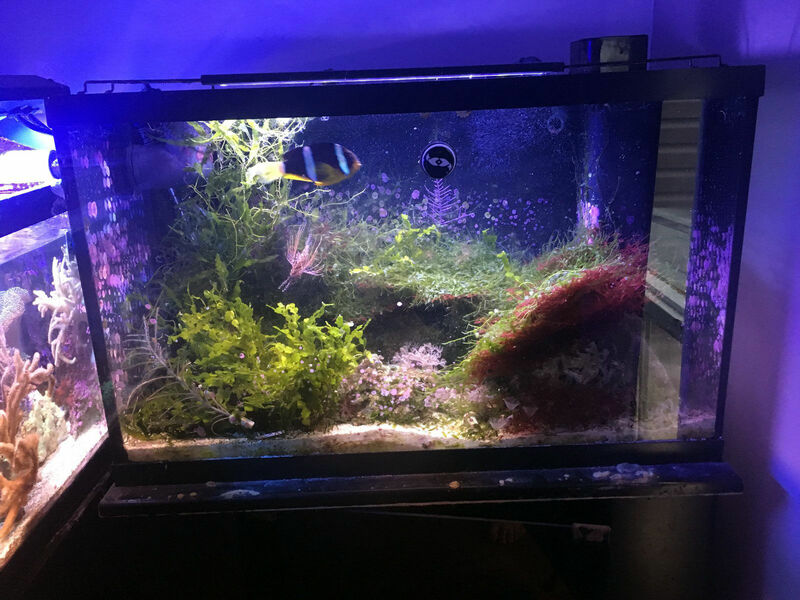 All in all I think just keeping the tank clean of film algae and giving them a healthy amount of flow and food is all you really need to do. If you feel your tank is lacking height or movement, definitely add some, or a lot. The leather corals sort of just do their own thing, like I said before I’m a bit of a lazy reefer so I chose corals I know would require less care and attention. The addition of a few drops of iodide per day helps keep the leathers and mushrooms healthy as well. My display refugium slowly turned into one of my favourite parts of the tank. I originally added it because I wanted to keep a mandarin but that never really happened. Not only does it house my favourite fish Big Mamma, it has really helped keep things stable over the year and a half. I've kept all sorts of macros in it, but two types of caulerpa have really taken over, which doesn't bother me too much. In addition to Big Mamma, the refugium houses hundreds of feather duster worms, a red mithrax crab, and a pom pom crab (at least I think it's still in there). I think that it has really played a big part in the success of this tank. It helps keep pH stable at night, and keeps phosphates and nitrates in check for me as well. Moving forward I will ALWAYS add a refugium to any new tank in the future, and if space permits, having a display fuge is a new fun dimension of the hobby for me. Especially when really cool things like sponges and feather dusters pop up on their own. I am truly always inspired by other hobbyists, their tanks and their willingness to help out and share knowledge. Whether it is here on Nano-Reef or in my local groups, there is so much out there to learn from and it’s truly amazing. 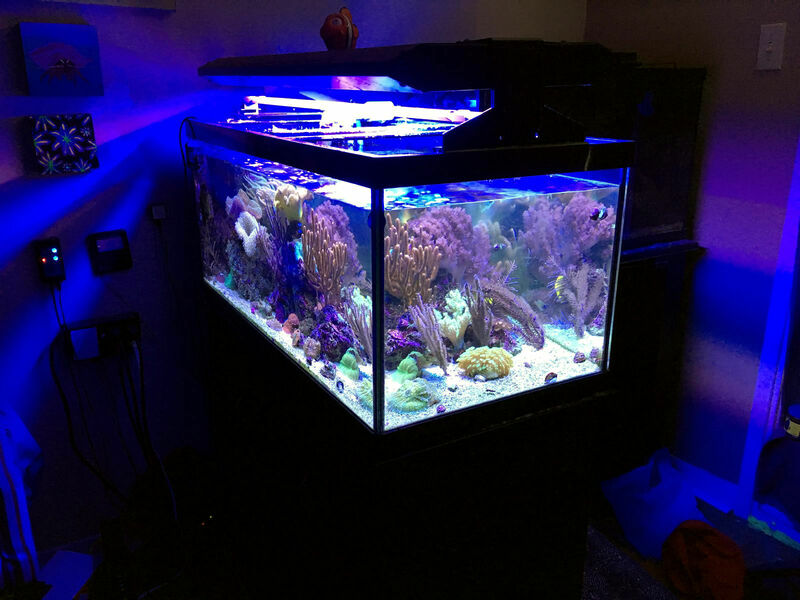 As far as tanks that inspired me, Lawnman’s 34g and Felicia's 40g breeder really helped me realize that soft coral reef tanks can be absolutely badass, and pushed me in the direction of gorgonians and leathers. Oh, and check out reefermikec on Instagram, his softy peninsula is what inspired me to do the peninsula style. My goal is to just always learn, enjoy, and inspire. The hobby can be a bit daunting sometimes and I want to show people it’s not as complicated as they may think. Obviously I regret not dipping every single coral or rock that entered the tank. The nudi disaster nearly broke me again. Also RESEARCH YOUR FISH! 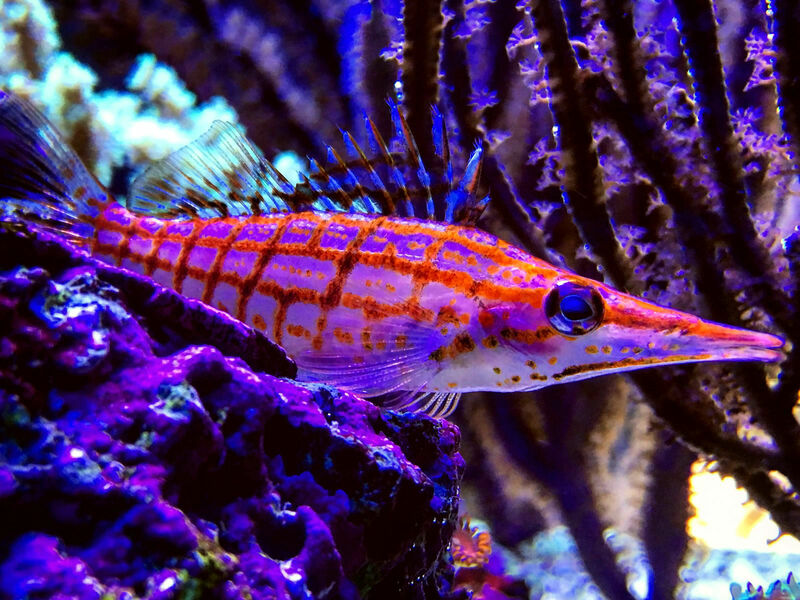 That damn neon wrasse... totally my fault. Well, when Christopher Marks chose my tank as TOTM, I was actually in the process of transferring it into my new 78g Starphire Cube. 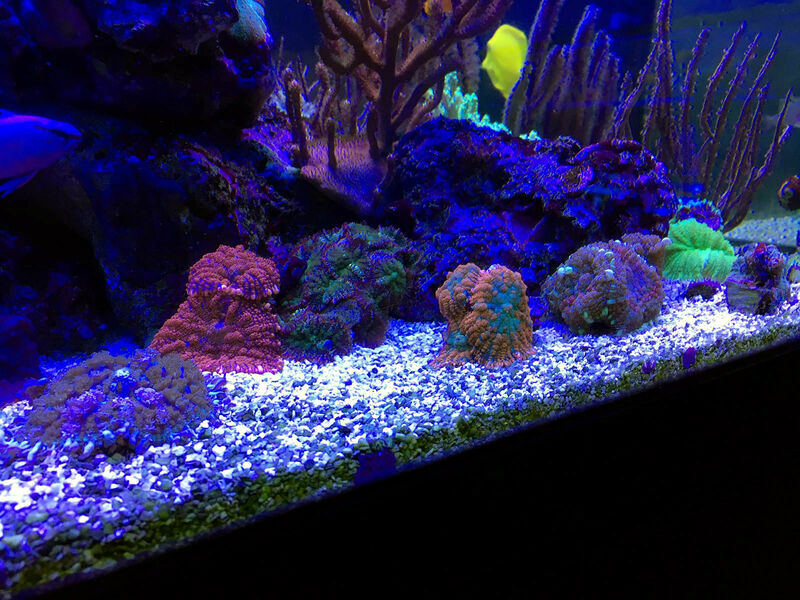 I find that a lot of us tend to get “bored” with the hobby and either upgrade or call it quits, or let our tanks just fade away. That wasn’t truly the case here, but between the bad decisions and regrets, and also coming across a freakin custom 78g Starphire cube, I just couldn’t pass it up. 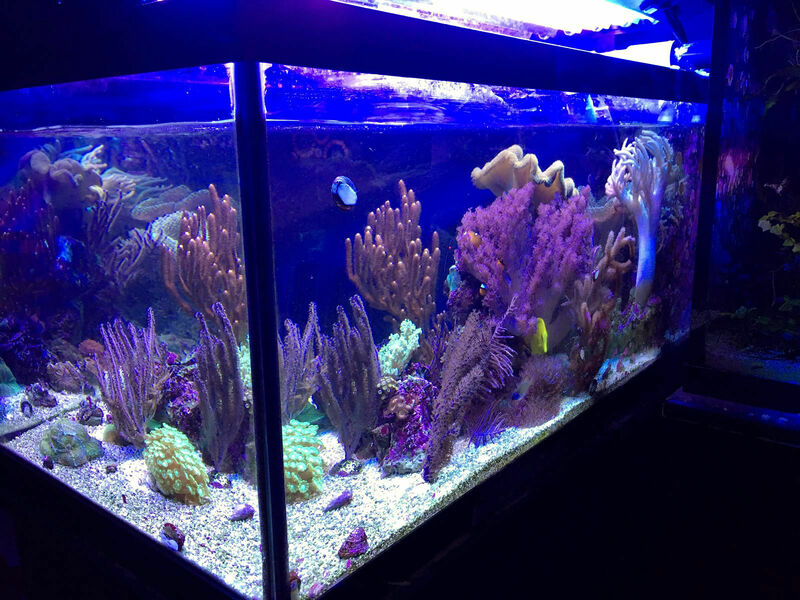 The 40g was both as amazing as it was terrible to me, and will always be my biggest learning experience in reefing. Sandbeds: Love em, looks nicer. Foods: Feed as much variety as you can, but focus on basic requirements. Coral Fads: It’s fun, but always buy what you like not what others like. Clean-up Crews: Hermit Crabs for life! ? Preparedness: We very recently had two large tornadoes rip through the city and take out the city's power grid. This was an eye opener for me as to how little I was prepared for an extended power outage. I think it should be talked about a bit more often in our hobby, and perhaps generators or battery backups should be included in lists of necessary equipment. We invest so much time and money into our tanks, not to mention the lives inside of them that depend on us. Do everything you can right now to be prepared for the next outage. It can and WILL happen. Do you. Don’t listen to everyone else and follow the latest trends on livestock or equipment. 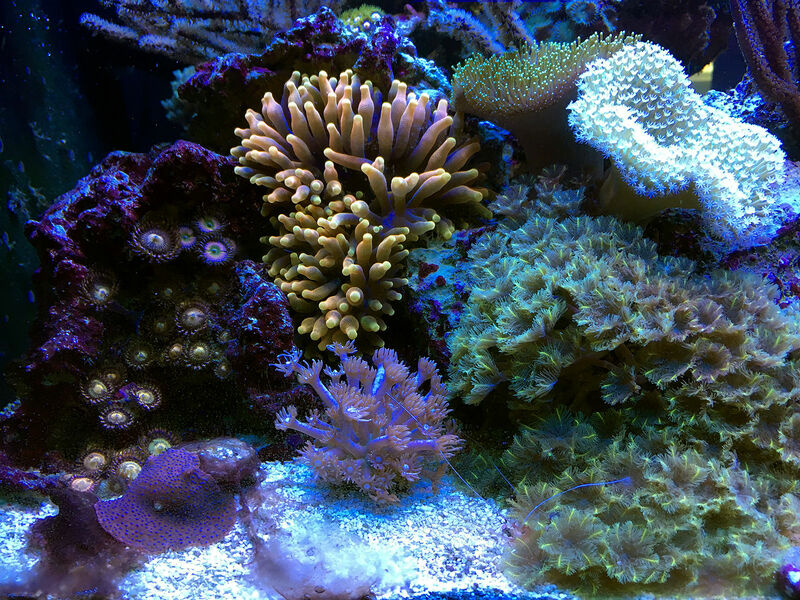 I mean it’s cool to have a list of named corals that you can brag about but at the end of the day it’s all about how much you are enjoying your tank and the hobby. Research your livestock before adding. Take your time. Do it for the the love not the likes. First of all, I want to thank everyone who nominated my tank, thank you so much! 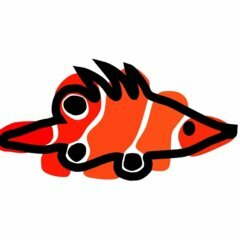 Thank you to everyone here on Nano-Reef for every comment and post on my thread, you guys are always so positive! Also all of those friends that have helped me out at home with this hobby, Mitch, Jerrod, Jerry, John, Gord, Steve, Justin, Tyler, you guys all rock. Finally, thanks to Christopher Marks for featuring my tank even though it was about to be upgraded, and for all the hard work you have put into N-R and our community over the years. Oh and for helping me change my password every time I forget it ?. Love the tank! Congrats sharbuckles! The new tank looks like it's going to be even better. It's been so long since I've seen a nice Fiji Toadstool in real life and the way things are going who knows if I ever will again. One question how come the 40g was running with a water level an inch or more below the trim? Also it's great to see Christopher still featuring tanks on the first of the month every month. 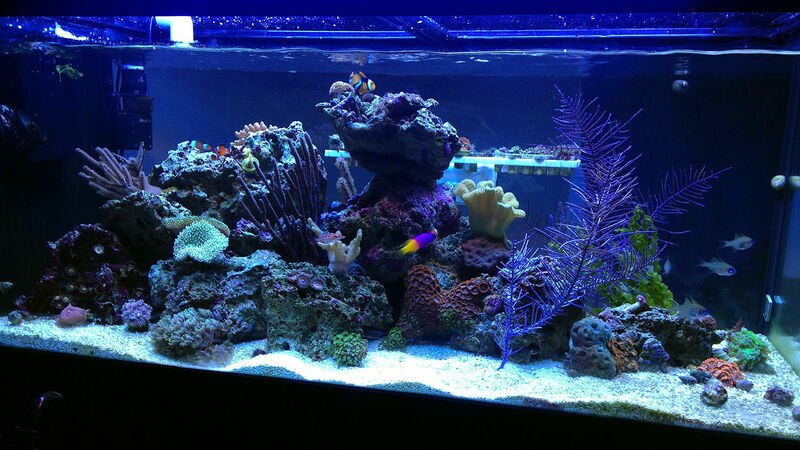 This is probably the last big reef site to do consistent tank of the month features. Even though I'm not posting as much as I have been in the past I will always be on nano-reef on the first of the month. Thanks. I installed the overflow incorrectly lol. Congrats!! Beautiful tank! Can’t wait to see the new cube!! I love this tank! The soft corals & gorgonians are fabulous.